An Increasingly Popular Alternative to Synthetic Gunstocks! 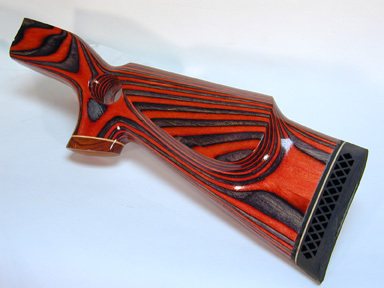 Our Laminated Gunstocks are Composed of 1/16" Birch Veneers Which Have Been Completely Saturated With Colored Dye, Then Hydraulically Pressed and Bonded Together Using a Superior Resin Adhesive. Our Laminated Colors Have Been Carefully Selected to Appeal to Sportsmen & Serious Target Shooters. Our Colors Have Proven Their Popularity Over Time By Repeat Sales. For a Rating Chart #1-10, on How to Choose the Right Color for YOU, CLICK HERE! Introductory Offers for our New Silhouette Style stocks! An Elegant Appearance -- Equally as Popular as the Brown Laminate. A Walnut Color Laminate -- Popular For Over a Half Century! The Original 2-Color Laminate -- Popular for Over 4 Decades! A Reddish Bark Color Has Been Added to Give a New Twist to Standard Camouflage. Highly Recommended Color! -- A Beautiful Blue Color Tone Set Off By the Black Veneers. Customer Finished--Straight Line Thumbhole Style with a 2 1/4" Varmint Forearm and a 1/2" Pad installed. A Rich Dark Burgundy Color With Darker Highlights - Attractive! This conservative dual color laminate truly enhances & complements a stainless steel barrel & action! For a more showy laminate, check our gallery for the Electric Blue color---goes great with a stainless setup as well. Has a Fluorescent, Iridescent Glow--Even in Dim Light!--The Name Says it All! 3/4lb to 1lb Lighter In Weight Than Other Laminates! Unfinished Silhouette Style Shown - Weight = 2lbs! #1 Brown Laminate A Walnut Color Laminate -- Popular For Over a Half Century! #1-1/2 Black Laminate An Elegant Appearance -- Equally as Popular as the Brown. #2 Imperial Laminate Recommended to Those Looking for Something Different Than the Standard Black or Brown. #3 Rosewood Laminate A Distinguished Looking Laminate -- The Only Other Popular Solid Color Tone Laminate. #4 Camouflage Laminate Popular with All of the Arms Manufacturers -- Standard Mountain Camo Color Tones. #5 Tigerwood Laminate Walnut & Maple Colors -- The Original 2-Color Laminate -- Popular for Over 4 Decades! #6 Royal Camouflage Laminate A Reddish Bark Color Has Been Added to Give a New Twist to Standard Camouflage. #7 Electric Blue Laminate Highly Recommended Color! -- A Beautiful Blue Color Tone Set Off By the Black Veneers. #9 Apache Gold Laminate Rich, Vibrant Colors with a Southwestern Flair. #10 Psychedelic Laminate Has a Fluorescent, Iridescent Glow--Even in Dim Light! --- The Name Says it All!